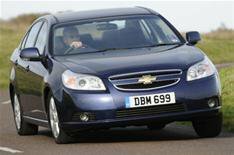 Chevrolet's Epica bargain | What Car? Chevrolet's Epica saloon will cost from 13,595 when it goes on sale in April. That's 400 less than the cost of the lowest priced Skoda Superb, despite the Epica boasting more interior space according to Chevrolet. Two engines are available: a 143bhp 2.0-litre petrol and a 148bhp 2.0-litre diesel. A five-speed manual gearbox is fitted as standard, but diesel buyers also have the option of an automatic gearbox. The car will be available in two trim levels, LS and LT.
LS models have air-conditioning, cruise control, electric windows, an MP3 CD player, six airbags and 16-inch alloy wheels, front, side and curtain airbags and power-adjustable mirrors. The LT trim level is only available on diesel-engined models, with prices starting from 16,595. Extra equipment on LT models includes electronic climate control, rear parking sensors, leather seat trim, heated front seats, rain-sensitive wipers, power-adjustable drivers seat, trip computer, electronic stability control and 17-inch alloy wheels.